Scott City, Kan. (westernkansasnews.com)–Tuesday’s doubleheader for Scott City would be their final non-league games of the season. 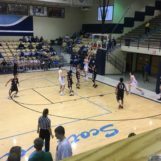 Looking to get a pair of wins against sub-state foes in Southwestern Heights, the Beavers didn’t disappoint, as the girls coasted to a 65-17 win, while the boys were able to pull away in the second half against a pesky Mustang team in a 65-52 win. This game was all Scott City. The Lady Beavers were able to force seven consecutive turnovers in the first quarter. It would be a 17-0 run for Scott City over a four-minute stretch, as they would lead 23-3 after eight minutes of play. Their second run went 11-0, and also added runs of six and five in between Lady Mustang points, giving them a 42-7 halftime lead. Scott City (11-5) would continue pushing their lead up and led by as many 48 at the end. Southwestern Heights (2-13) was only able to score on consecutive possessions once, which came in the third quarter. After a 59-15 Lady Beaver lead at the end of the third period, a running clock was used in the fourth, that had Scott City outscoring the Lady Mustangs 6-2, en route to a 65-17 win. Lyndi Rumford and Brynn McCormick led Scott City with 17 points. They were 12-17 at the free throw line and had 14 turnovers. Shelby Sutherland led Southwestern Heights with five points. They were 4-8 from the charity line. With the win, Scott City clinched a first round home game for sub-state, and also improved their all-time lead in the series against the Lady Mustangs to 4-1, which now includes a three-game win streak. They allowed the fewest points since their 55-16 win against Southwestern Heights last year. Scott City has scored 60 points for a third straight game for the first time since their first three games of the 1999-2000 season. Despite an early lead change and two ties, Scott City led the game for a vast majority of the night. While the Beavers led throughout, Southwestern Heights stayed in the game for the first two and a half periods. The Beavers led 13-6 after the first quarter, ending the period on a 9-2 run. They would push their lead to 11 points on a pair of occasions, with the last coming with 4:29 left before halftime at 22-11. The Mustangs would answer back on a 10-3 run to get to within 25-21 with 54 seconds left in the second period, before Scott City took a six point lead at intermission at 28-22. A 7-2 run propelled the Beavers in the second half, getting them to a 35-24 lead midway through the third quarter. The second big run for Scott City (11-5) would come at the end of the third quarter and into the fourth quarter. An 8-0 run pushed their lead to 51-32 with 7:42 remaining. They also used a 7-2 run to give them their biggest lead of the game at 57-37 with 5:37 left. Southwestern Heights (5-10) fought back, pulling to within 11 late in the game at 63-52 with 11 seconds remaining, by using a 7-0 run. The Beavers scored the final points of the game on two free throws to win 65-52. Leading the way for Scott City was Marshall Faurot with 17 points and four triples, Joe Evans had 16 points, while Parker Vulgamore and Hunter Yager added 10 points apiece. The Beavers shot 16-28 from the free throw line and had 16 turnovers. Leading Southwestern Heights with 18 points was Ruben Torres, and Efren Mercado added 10. The Mustangs were 11-18 at the line and had 16 turnovers. With the win, Scott City has clinched their 15th consecutive non-losing season. They also improved their record in the series with the Mustangs to 7-0. Southwestern Heights has dropped four straight games. Scott City will remain at home, hosting Colby on Friday night, while Southwestern Heights visits South Gray on Friday.